Crisp cool pure linen sheets are the ultimate luxury in bedlinen. Linen sheet sets spell coolness and lightweight comfort. Though “linen” is often used to simply mean beddings, linen is actually a kind of fabric from the flax plant. Due to the process of making quality linen, it is usually priced higher than other fabrics. Nonetheless, it’s price is worth its comfort and other benefits. Transport yourself back to the luxury of Titanic and the Edwardian era when linen was de rigueur and you will never sleep in anything else again! If you want to sleep in the luxury of pure linen sheets every night in your own bed then check out these top picks of high quality linen sheet sets. Linen offers both comfort & style, keeps you snug during winter & cool in the summer. Regardless of which you choose, each of these sumptuously soft linen sheet sets offer a great blend of comfort, style, and affordability, and will help you sleep comfortably whatever the season. With the amount of time you spend in bed, you definitely deserve something luxurious to sleep in. You’ll appreciate the natural absorbency and hypo-allergenic properties of this set of 100% pure linen bed sheets from Linoto. Sourced from Italy and Belgium, the center of the flax industry and made in USA you are assured of quality linen that is long lasting and hard wearing. These linen sheets have been pre-washed and are ready to use so they have a smooth feel which gives them that 5 star soft feel. They’re highly breathable to keep you cool on hot nights and stay warm when the temperatures hit low. This natural linen bedding also absorbs moisture well but remains dry to the skin for a comfortable night’s sleep. Each Linoto linen sheet set comes with a linen flat sheet , and a deep pocket linen fitted sheet with elastic hem on all sides for superior fit and two standard size pillowcases . All these bear the properties of luxury linen to provide you with the best luxury sleep experience. They are easy to wash, require no ironing, get softer after each wash and remain wrinkle-free. It’s very clear from the raving reviews that sleepers love Linoto linen. A customer recommended the sheets for the generous sizing of the flat sheet and how easy they were to maintain. Although some customers had issues with the rough texture of the sheets, they indicated that they got softer after each wash. This feature is attributed to the high-quality linen which tends to have a rough feel while new. You’ll also find a wide range of sizes and colors to choose from of this high end real linen product. This set of sheets is woven from 100% French flax which is known for its superior quality and comfort. The sheets have a vintage look and a drape which gives the luxurious feel. They are pre-washed and suitable for all seasons; thanks to the absorption and breathability features. They wash well and do not need ironing for a softer feel. 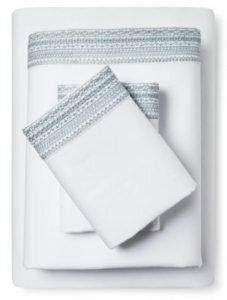 The Minimal Linen Sheet Set comes with a fitted sheet and two pillowcases , and you can opt to add a flat sheet in the package. Care instructions indicate washing in the gentle cycle of the machine in temperatures of 30ºC/86ºF . They do not require bleaching since they are stain resistant. A tumble on low is adequate to eliminate moisture. One of the features that make them stand out is how well they regulate temperature. Also, the sheets have shown to retain the shape without wrinkles. However, one user indicated that sheets are a little scratchy for the first use but get softer with every wash. That is because linen is naturally rough. This luxury French linen bedding is available in sizes: Full, Queen, King, King Call and comes in 7 neutral vintage color to suit any decor. Get $20 OFF + free shipping with code SUMMER. 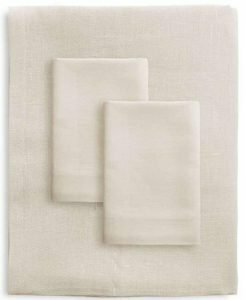 This set of 100% linen sheets is woven from natural French flax to bring about the luxurious finish. They are of premium quality and last long with minimal maintenance. The linen texture has a beautiful drape which makes the sheets ideal for daily use. Also, these sheets absorb moisture well and remain dry which makes them great for summer and other hot seasons. The Merryfeel French Linen Bedding Sheets come as a set of one fitted sheet , one flat linen sheet , and two standard size linen pillowcases . The fitted sheet works with mattresses up to 15″ for a snug fit. These sheets require proper care which included washing on a gentle cycle with cold or warm water. A warm tumble dry or line hanging is ideal for drying. One outstanding feature that sleepers appreciated is how comfortable these sheets are for ALL seasons. They proved to wash well, and the stain resistant property enables them for daily use. However, like other linen, these were scratchy for the first few uses but softened after a short period. This feature is standard with linen, but it is a guarantee of durability. One thing to point out is that the package has a slight odd-smell that cleared with the first wash. This superb French linen bedding comes at a great price compared to our first two choices. Available in sizes Twin-Split King and 8 stunningly beautiful colors to choose from. These sheets are made of 100 % Italian linen which is naturally stronger than other fabrics. This Italian linen bedding is crisp, cool and anti-static for a comfortable nights sleep. The sheets are highly absorbent which makes them suitable for all year round use. Additionally, they are of premium quality and last a long time with minimal maintenance. They are lint-free and get a soft feel after each wash. These Italian linen sheets are hypoallergenic and have a moisture-wicking property for a comfortable night’s sleep. Also, these help to keep you fresh in the summer and warm in the winter since they can adjust to the body temperature. The sheets have a quality stitching to last in the right condition with regular use. These sheets are not part of a set and can be purchased separately. They are available in sizes: Queen (Linen Flat, Fitted and Deep-Fitted Sheets) and King (Linen Flat, Fitted and Deep-Fitted Sheets) and are offered in three neutral shades: flax, ivory and white. One feature that most customers echoed is the fresh feel. They proved to be comfortable to use all year around; thanks to its moisture-wicking properties. A customer mentioned that unlike most linen sheets, these were soft from the first use. There is a 90-day trial period, free shipping and can be customized with Signature Monogramming (great gift idea). Luxor Linens – Get 25% Off with this link. Pros: Premium quality linen, highly breathable and hypoallergenic, comfortable for all seasons, 90 day trial. The 100% Linen Solid Sheet Set from Fieldcrest® is lightweight to keep you comfortable all night long. For a luxurious look, these sheets feature an embroidered trim and have a beautiful drape. They are smooth and cool to the touch which makes them suitable for the warm summer weather. The Linen Sheet Set Fieldcrest Collection comes with one fitted sheet , a flat sheet , and two pillowcases . They are reasonably sized to fit in respective mattress sizes. Another reason to love these sheets is that the fitted sheet features deep pockets for a snug fit which translates into a comfortable sleep. A machine wash and tumble drying on low is adequate for maintenance. This set is available in three shades, comes in full, queen, king and cal-king. Customers appreciated that these sheets worked well for the hot seasons. They have the cool touch, lightweight and had the soft feel for comfortable nights. Although some users had concerns about the sheets wrinkling, it wasn’t a significant issue since the sheets flattened after fitting on the mattress. “Amazing Value and Quality for Linen Sheets“, raved one reviewer. Pros: Quality linen, soft, lightweight, generous size for the flat sheet, great value for money. Your bed has a story to tell. Every layer, material and color represents details that reflect your personality and taste. I’ve discovered as I have aged older it’s about quality not quantity. When it comes to the best luxury sheets, the linen range for me personally tops it all for both comfort and style! You’ll have a hard time persuading me to using cotton bedding again after been introduced to linen bedding on a buying trip in Europe three years ago. Linen is ecologically friendly as flax the raw material requires minimal chemicals and only a little water. Note that linen can grow in a variety of terrains and conditions where food crops cannot grow. Also, it can be cultivated without the use of chemicals. Linen’s anti-static properties help it to resist dust and make it ideal for those suffering from allergies. It is an easy care product that looks best with minimal ironing. Linen is very breathable making it ideal for warm seasons. It will allow the coolness in at night. They have a high moisture absorbency which is why they’re often ranked among the best cooling sheets out there. Are linen sheets comfortable? Short answer, yes! 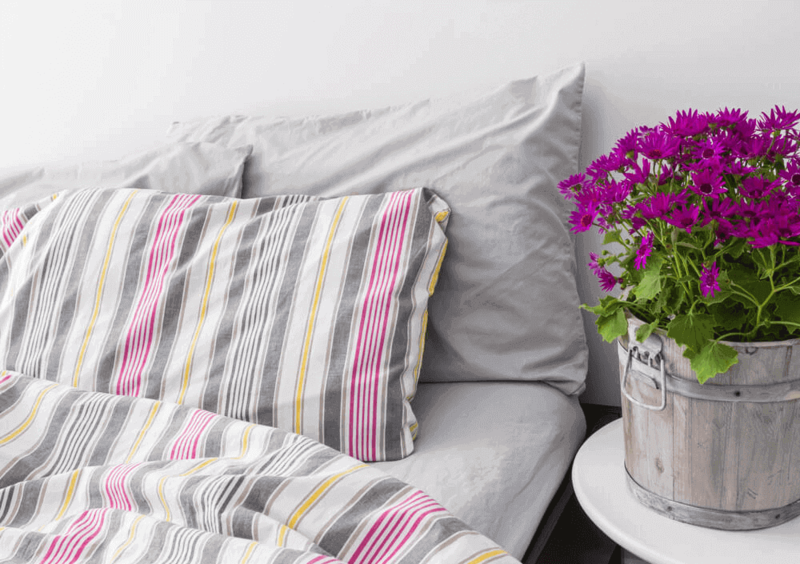 Here’s what you need to know when looking for the best linen bedding range for styling your bedroom sanctuary. Whilst very similar, they’re equally very different in how they look, feel and benefits. Linen derives from the plant called flax which is grown in the colder climates of the world, such as western and northern Europe. Flax is notably ecologically friendly using minimal chemicals compared to cotton. High quality linen has a denser texture, is stronger than cotton (30% more), is longer-lasting, highly-breathable, excellent heat conductivity properties and thus is generally more expensive than cotton, though this isn’t always the case. On the negative side, it feels rough at first and wrinkles easily. But, with several washes and usage, the fabric gets relatively softer quicker. Linen Bedding is breathable and lightweight with a vintage “rumpled” up look that’s both chic and elegant. Linen, however, isn’t for everyone. Some folks prefer the feel of cotton. Cotton is a softer fabric than linen that feels light with a slight crispness. It’s an airy material suitable for any weather, though certain types of cotton materials may be too warm for hot and humid weather. But high quality cotton sheets in general are all-purpose, and fit numerous environments from the coldest to the warmest climates. Go for Pima or Egyptian cotton sheets. The Percale weave is easy to care for and is perfect for hot or cool sleepers and is what fine 5-star hotels utilize. How Long Do Linen Sheets Last? Considerably longer than cotton sheets. While cotton sheets have a lifetime of around 3-5 years, linen sheets are treble or quadruple that, lasting for 1-2 decades. Linen will last for many years if looked after correctly, while softening the more you wash it. That’s one of the many reasons why Europeans choose linen over cotton bedding. Thread count refers to the number of threads per square inch of fabric. However thread count is NOT indicator of quality. A good thread count range is between 180-280 giving you both comfort and durability. 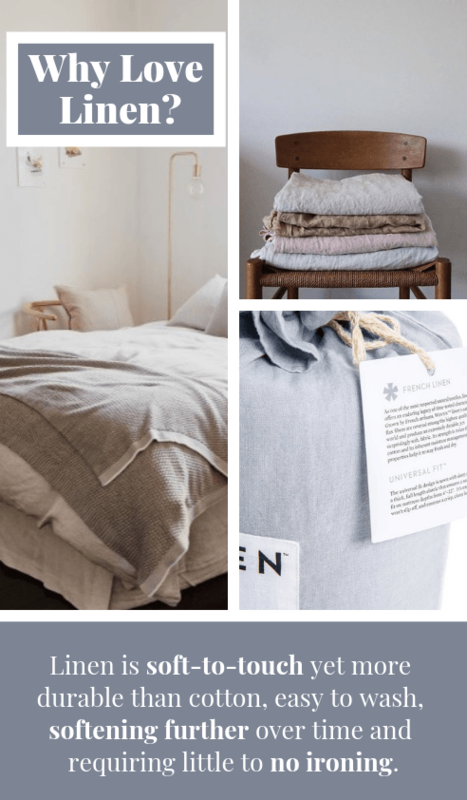 When it comes to linen thread count however, linen bedding has a lower thread count range of between 80-150 and that’s due to the linen fabric used for sheeting. While this can be a guiding factor, it does not necessarily mean that linen sheets with a low thread count are of low quality. But, it is important to note that a high thread count brings about a softer feel while a low one gives a rough texture and is prone to shrinkage. Before you can select the colors and textures, it is essential to find a size that fits well on your bed and leaves enough material for a beautiful drape. For fitting sheets, ensure you get the exact size as the mattress for a snug fit. You might need to have your bed dimensions ready since some sizes vary even with the usual bed sizes. Where does the Best Linen In the World Come From? Europe – specifically the Normandy region in France and Belgium due to their optimal climates for growing flax. Also, Italy because they have the best weaving mills. 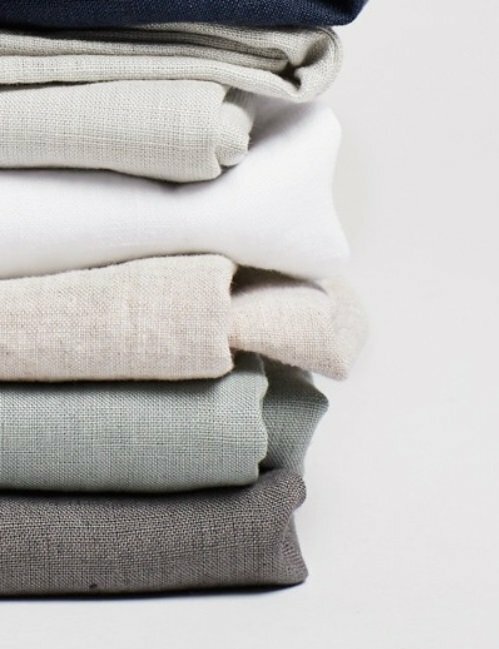 We get so many questions regarding washing and care of linen, so here how to look after your linen. Before your first use it is advisable to wash your linen at low temperature (30°C) with a small quantity of detergent and maximum water. Do not wash in cold water. Going forward, here is the normal washing and drying process. Machine wash separately at up to 60°C, and line dry, do not bleach or tumble dry, hot iron whilst damp. When it comes to laundering linen, gentle machine washing is the keyword here! Load the washing machine in a normal way. Don’t overload the machine and use maximum water. Linen bedding is best washed in a warm or cold water cycle. Don’t use detergents with enzymes. They attack the fibers and reduce the life cycle of the product. Avoid whiteners in general. They weaken the strength of the fabric and reduce the life cycle of the linen. Remove it from the machine while it is still a little damp, hang it out on the line and let nature and gravity do its work. If you prefer a crease-free bedding experience then we suggest ironing your linen while the fabric is still damp. Then, simply ENJOY. The above linen sheets have proved to be of outstanding quality and durability. Each has luxury attached to them. There is a linen sheet set here for every budget. Each has received raving reviews. You’ll be pleasantly surprised with the timeless appeal of linen and how amazingly conducive this fabric is to having a restful night’s sleep. 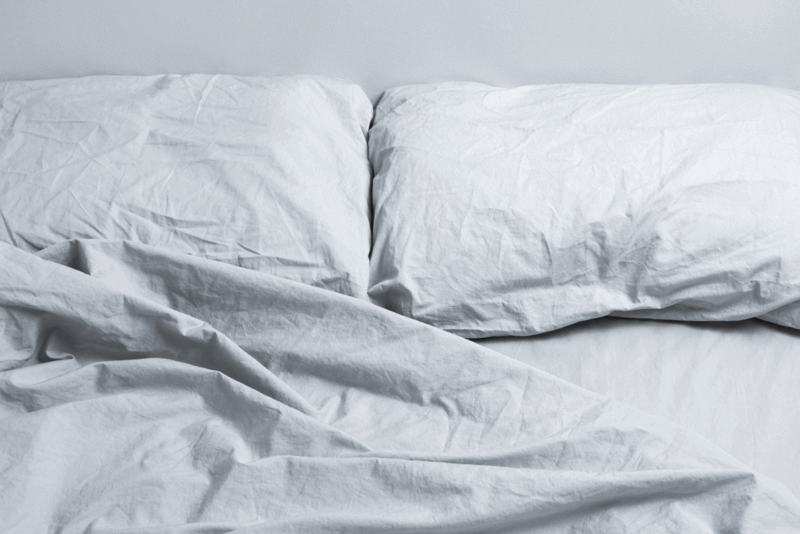 Trust me … you too will become a linen bedding convert after one night’s sleep! 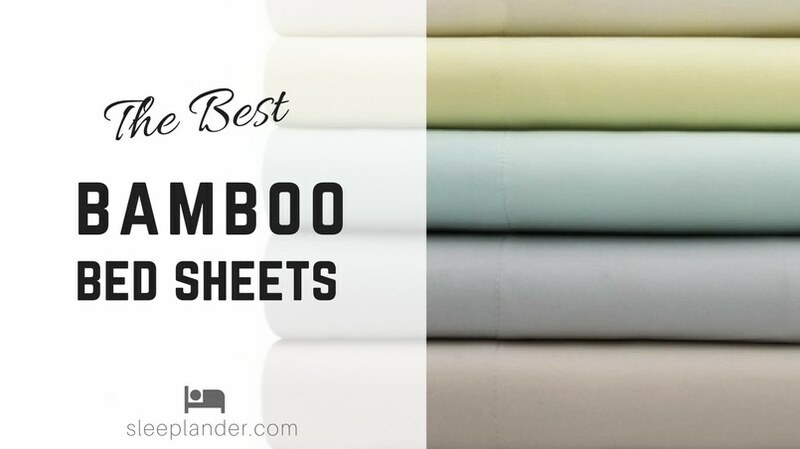 Best Bamboo Sheets Reviews: Want a Cool, Soft and Comfortable Sleeping Experience?